Aboard Emirates flights are some of the finest wines from all over the world. Emirates serves some of the finest wines from the main wine-producing regions in the world. Sourcing their selection from 12 countries in the main wine-producing regions of the world—Argentina, Australia, Austria, Chile, France, Germany, Italy, New Zealand, Portugal, South Africa, Spain, and the USA—the airline ensures every glass of wine served onboard meets the often sophisticated and discriminating taste of passengers. How do they source the finest wines from all over the world? At the heart of Emirates’ strategy is its unique approach to purchasing exceptional wines en primeur, years before they are released to the market, and then allowing these vintages to mature and reach their potential before serving on board. While most airlines source their wines through brokers or tenders, Emirates’ team of wine connoisseurs has built direct relationships with some of the world’s most prestigious vineyards to handpick and secure the most exclusive and rare wines for its customers. The airline has invested an estimated US$700 million in its wine programme since 2006. Emirates’ wine cellar in Burgundy, France stores 7 million bottles, of which some are ready for drinking in 2025. Bordeaux enthusiasts are spoiled for choice as wines from this region have always been the mainstay of the Emirates wine offering—58 percent of the red wine in First Class and Business Class come from the region. 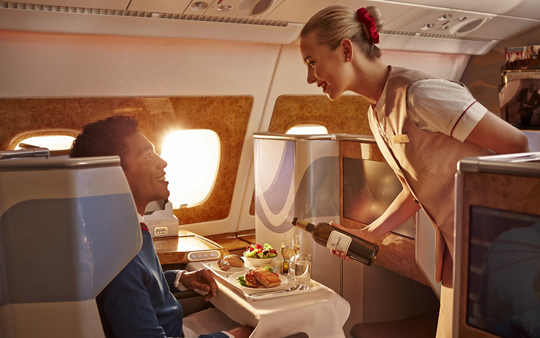 Emirates’ selection also includes recently added wines such as Pavillon Blanc du Château Margaux, the white wine variant of Château Margaux, as well as vintages of La Clarté de Haut-Brion, known to be rare and exclusive due to its small-scale production. Other white Bordeaux wines include Château Smith Haut Lafitte and Château Malartic-Lagravière. Emirates is also the biggest global partner of Dom Perignon, one of the top vintage Champagne brands in the world. It has also placed great importance on wines from Burgundy and purchases directly from exclusive Grand cru vineyards such as Chevalier-Montrachet, Charmes-Chambertin, and Échezeaux. The airline’s long-standing relationships with wine producers have meant access to some of the rarest and exclusive wines. From the Corton-Charlemagne Grand Cru region alone, considered to be among the finest of Burgundy’s white wines, Emirates purchased 2,000 cases in 2015, which is equivalent to 10 percent of the total production in the region. Other recent additions to the Emirates wine cellar include fine Italian wines such as Solaia and Ornellaia for First Class, and the highly sought-after Super Tuscan wine Tignanello which will be added to the Business Class offering in the coming years.